This Brain Teaser is to Test your Mental Speed. This is the Brain Speed Test for you. Try to solve this Brain teaser as quickly as possible. Let's see how fast you can think and come up with the correct solution. Write you answer and timing to solve this Mental Speed Test Brainteaser in the comments! 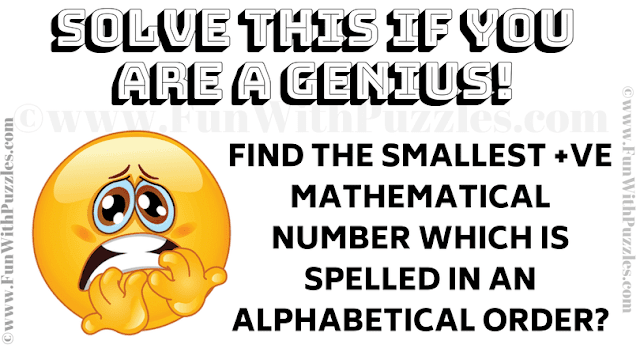 Can you solve this Mental Speed Test Brain Teaser? Answer of this "Mental Speed Test Brain Teaser", can be viewed by clicking on answer button. Please do give your best try before looking at the answer. The Answer is Forty (40). Many people write 40 as Fourty which is incorrect spelling in British or American English.